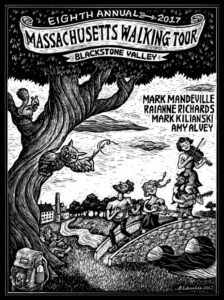 Artist Dan Blakeslee has done it again – creating us a locale-specific poster for this year’s Massachusetts Walking Tour. You will soon see these up everywhere in the Blackstone Valley. 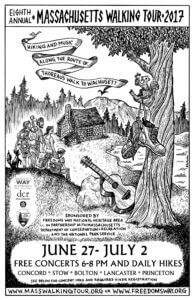 Since 2010, Dan has created the artwork found on all MWT posters and the short run of live recordings made each year. In 2012, he joined the troupe as a musician and walker during our central Massachusetts loop. More of Dan’s artwork and music can be found at danblakeslee.com.